We are now displaying prices for selected items below on our Used, New & Surplus page. If you don't see a price for an item it is available upon request. By scrolling down this page you can access, by category, over 200 different items with detailed descriptions. You can view images where available and request more information by email for each item listed. Please Note: You can request images for most items listed below even if they are not present on our web site. Click on the item, click on the email link, and request photos. Thank you. 370 Hp @ 3000 RPM. Cummins Marine 5.9 6BTA Marine Diesel Engine - Rebuilt by Trans Atlantic Diesels. CPL #2208. Transmission options at additional cost available on request. 265 Hp @ 2500 RPM. Engine is Heat Exchanger Cooled with 24V Electrics, engine harness less instrument panel. Engine was removed from a high end vessel having been meticulously serviced and maintained. Numerous new parts were fitted as precautionary maintenance. Recorded run hours are approximately 6,000+. Engine has been serviced and fully test run. 212 Hp @ 2500 RPM. Ford Sabre Marine Engines type 212C as used in US Army Bridge Erection vessels. Low hour ex Govt. units fully tested and serviced. New Electrics and gauge panels fitted. 6 months warranty. Ford Sabre 212C 6 cyl Marine Diesel Engine. CORE ENGINES - Some complete, some long blocks, & some to short blocks. All sold as cores or running take outs. We also have take off accessories. Call to see if we have what you might be looking for. These were widely used in US Army Bridge Erection Vessels. We also have the Dowty Jet drives that they were originally coupled to. Please see item TRAN-1100 on this page. 130 Hp @ 2800 RPM. Perkins 6354.4 Rebuilding your own engine? We currently offer a full line of Engine Overhaul Kits, shop manual included. Major and minor remanufactured items are available. You can tailor your level of rebuild from top overhaul to a full rebuild, with or without new marine accessories. Click at right for more info. At this time, we are offering the above in place of pre-assembled rebuilt engines. 120 Hp @ 2800 RPM. Perkins 6.354 M Fully rebuilt with new marine accessories. Can be supplied with rebuilt transmission at additional cost. Includes new zero hour instrument panel with full gages and alarms. New starter and alternator. 85 Hp @ 2800 RPM. Perkins 4.236 Diesel Engine. Rebuilding your own engine? We currently offer a full line of Engine Overhaul Kits, shop manual included. Major and minor remanufactured items are available. You can tailor your level of rebuild from top overhaul to a full rebuild, with or without new marine accessories. Click at right for more info. At this time, we are offering the above in place of pre-assembled rebuilt engines. Rebuilt Perkins 4.236 Marine Diesel Engine package. Complete with New Bowman Manifold / Heat exchanger assembly and new marine accessories. New 12V Starter & Alternator. New Instrument panel & engines mounts. 75 Hp @ 3000 RPM. New Volvo D2-75 Marine Diesel Engine complete with deluxe instrument panel, harness, engine mounts, exhaust elbow and optional inline transmission or sail drive. 65 Hp @ 2600 RPM. 60 Hp @ 3000 RPM. New Volvo D2-60 Marine Diesel Engine complete with instrument gauges, start/stop button panel, wiring harness, connection kit, wet exhaust elbow, 12V electrics and optional transmissions. 50 Hp @ 3000 RPM. New Volvo D2-50 Marine Diesel Engine complete with instrument gauges, start/stop button panel, wiring harness, connection kit, wet exhaust elbow, 12V electrics and optional Transmissions. 50 Hp @ 4000 RPM. Perkins 4.108 Rebuilding your own engine? We currently offer a full line of Engine Overhaul Kits, shop manual included. Major and minor remanufactured items are available. You can tailor your level of rebuild from top overhaul to a full rebuild, with or without new marine accessories. Click at right for more info. At this time, we are offering the above in place of pre-assembled rebuilt engines. 17.96 HP @ 3600 RPM. Yanmar 2GM20F Diesel Engine - Heat exchanger cooled. Complete unit with transmission and new gauge panel (we did not get the original panel). This engine was removed from an abandoned yacht and has extremely low run hors. The alternator belt still had the original factory paint on it. Estimate hours to be between 75 and 150. Original paint was good but had some chips so we freshened up the paint work . Engine has been fully serviced and shop tested. Mercedes Engine OM63612 x/n 632.911.000124 NON RUNNING. Parts engine only, needs repair/rebuild. Bedford 466 Marine Engine Core, complete, less heat exchanger and fresh water pump. Core 80% complete. 6V92TA DDEC automotive bus engine, Left hand as viewing from the Front (non standard), s/n 06VF171749, condition unknown, sold as rebuildable core, complete with starter, heavy duty alternator, air compressor, unit in original steel mounting frame. Navistar DTA 360, Non Electronic Engine Bosch inline injector pump, Large alternator, Came with Allison AT 545 Automatic Trans. & Torque converter, Price $2,500.00 Add $400 for Transmission. GM 8.2 Truck Engine. Non Electronic Good Running take out. Model #40877300, S.O.# 3792849, Customer spec 1861501595 0890217815, max. No load 3050, large alternator, Came with Allison AT 545, Price $1950. Add $400 for Trans & Torque Converter. 80 Hp @ 2800 RPM. 4.236 Perkins 4236 Long Block Rebuilding your own engine? We currently offer a full line of Engine Overhaul Kits, shop manual included. Major and minor remanufactured items are available. You can tailor your level of rebuild from top overhaul to a full rebuild, with or without new marine accessories. Click at right for more info. At this time, we are offering the above in place of pre-assembled rebuilt engines. Perkins 4.236 Power Unit. Engine was a standby with only 247 hours from new. Serviced with new gaskets and seals. Full gauge panel that can be remote mounted or extended if needed with auto shut down protection. Includes muffler and air filter. Can be supplied with New PTO clutch for an additional $1,400. Engine Serial Number is LD33498U037998M. Perkins 4.236 Diesel Power Unit. Zero hours from complete comprehensive overhaul - test time only. New gauge panel with auto shutdown protection. Panel can be mounted on unit or extended for a remote mount. Includes muffler and air filter. New power take off clutch. 78 HP @ 2600 RPM. Perkins 4.236G, Rebuilt industrial unit, test run prior to shipping, six months parts warranty, priced accordingly s/n LE70089U6313021RB. Can operate on LP gas. New Cummins 4B3.3 Power Unit. Shown with SAE #4 housing with 10" clutch flywheel. SAE #3 available, radiator cooled, instrument panel, muffler, air filter, etc. Full gauge panel including auto shut down protection, New Engine Factory Warranty. PTO Clutch available at additional cost. New Cummins 4B3.3 Power Unit. Radiator cooled, instrument panel, muffler, air filter, full gauge panel including auto shut down protection, New Engine Factory Warranty, New PTO Clutch. Kubota 4 cyl. Diesel model V1903 BG-E 1.9 litre. New Surplus: Less flywheel bell housing, starter & alternator. Perkins 103-07 Industrial Diesel Engines, 2 engines available, both good running & tested, take out units. Electric clutch assembly available for belt driven take off. Originally fitted to Toro Golf Course Mowers. Removed due to hydraulic failures. Engines still strong with varied amount of hours. 12.9 HP @ 3600 RPM. New Surplus Yanmar Diesel Engine type 2TNE68C-KG2, Disp. 0.523, engine serial number 05033, Fan through flywheel, SAE # 5 bell housing, 24V starter & alternator. KUBOTA Z430 (0.435L) 2 Cylinder Diesel Engine. Used Diesel Engine removed from Kubota Tractor G4200 HST. Remaining Tractor Parts are available for sale. 8V92 Turbo Detroit Diesel Engine - Ex foam laying fire truck take out engine. Believed to have been used at USAF base. Low Miles. Low Hours. Both run perfectly. This unit had run approximately 600 hours when it developed a problem with output in the electrical generating end. It was tested, not by TAD, but was described as a winding problem. The engine was removed by TAD for another project. We are offering some good used low hour parts for sale. We have not priced them individually, but the more items purchased, the more reasonable the pricing becomes. Sound shield is in good shape with good working latches, etc. There is on small panel at the front missing. The exhaust elbow is only offered with the tank and manifold assembly – will not be sold separately. If interested, contact us with a list of items of interest and we will work up pricing. 95 kW @ 1800 RPM. Kohler generator unit 120/208/220V, three phase, powered by V8 International LP gas fully enclosed, 187 hours run time, standby by use only. 75 kVA/60 kW @ 1800 RPM. Perkins Turbocharged 4.236 Diesel Powered Generator Set, 120V-240V, 1 phase, 60 Hz, 12 lead unit which can be reconnected for three phase. Radiator cooled, skid mounted, full engine instrumentation with automatic shut down. Maintained by large corporation. Fully tested and serviced. Shipping Weight 1585-lbs (6’ x 3’ x 4’). 60 kW @ 1800 RPM. Diesel Generator Set Powered by Cummins 4BT 3.9 Three phase, 480V 60 Hz, diesel generator set powered by Cummins 4BT 3.9, turbocharged 3 cylinder engine, S/N: 46476219. Unit is coupled to a Newage Stamford Model UCI224F1L. 12 Lead fully reconnectable to 1 or 3 phase high or low voltage. Radiator cooled, new gauges, auto shutdown protection, shop tested and serviced, low hours. New Cummins Diesel Generator, Powered by Cummins 4B3.3 Radiator Cooled, fuel skid base mounted 55 gallon, auto shut down protection, 44 kVA – 35 kW, 220V/110V, single phase 60 Hz. 4 cylinder Cummins industrial diesel engine model 4B3.3 s/n 68008264, approx. weight 800lbs, fuel consumption @ 50% load is 1.5 gph. 125V, DC current, 1750 RPM, 2 bearing generator ends only. 120/240 v 1 phase 60Hz Onan model 12.ODJC-18R/12927AD s/n F860827201 12 lead unit could be connected 3 phase if required. Heavy duty unit, has enclosure including side panels (not shown). Onan 2 cylinder LP Gas Generator, fully enclosed, like new. Dimensions 39" L x 23 1/2" W x 35" H with enclosure, 34" L x 20 W x 23 H without enclosure. Model 6.5 NH-3CR-1600 4 K, s/n A793417196, AC 120-240 1 ph. 6.5 KVA, 6.5 kW 54/27 amp, 1800 rpm. Kohler Gas Powered Generator Set Model 4-5C421-RV, Spec 13915A, s/n 133563, 120v, 60Hz, 37amps, 1800rpm, Slow running quiet heavy duty unit. Shop tested, serviced and painted. 3.3 kW @ 3600 RPM. Kama air cooled diesel generator, Model KDE3300E, 120/240 Volt, single phase. Electric or recoil hand start. Optional spare new engine available. Test hours only, as new. 2.5 kVA, 115V 60 Hz 1 ph or 2.5 kVA 130 V 60 Hz 3ph. Powered by Deutz F1l208D, 1 cylinder air cooled diesel engine, electric start with packer as used on railroad line maintenance. S/N: A 1154253, Powered a Perkins 4 cylinder 4.236. Runs and welds fine. Powered a Detroit Diesel 3.53. Runs and welds fine. 71 Series Remanufactured Exchange. Reduction by request. Borg Warner Velvet Drive New Take off Front end of V-drive s/n 3133. Borg Warner Velvet Drive 71 Series Mercruiser Inboard/Outboard Model AS20 including backend, rebuilt. Borg Warner Velvet Drive 71 Series Rebuilt 1:1 reduction. Borg Warner Velvet Drive 71 Series Rebuilt 1.52:1 reduction, 4" coupling. Borg Warner Velvet Drive 71 Series Rebuilt 1.91:1 reduction. Borg Warner Velvet Drive 71 Series Rebuilt 1.88:1 reduction, 5" coupling. Borg Warner Velvet Drive 71 Series Rebuilt 2.57:1 reduction, 5" coupling. Borg Warner Velvet Drive 71 Series 1:1 reduction. Rebuilt Borg Warner Velvet Drive 71 Series 2.91:1 reduction, TAD s/n 546, 556. Rebuilt Borg Warner Velvet Drive 1:1 unit for Mercruiser inboard/outboard. New Take off Borg Warner Front half V Drive only. New Take off Borg Warner Velvet Drive 1017-000-104 s/n 91202. 72 Series Reman Exchange. Reduction by request. Borg Warner Velvet Drive 72 Series Rebuilt 1.51: reduction, 5" coupling. Borg Warner Velvet Drive 72 Series Rebuilt 1.91:1 reduction, 5" coupling. Borg Warner Velvet Drive 72 Series Rebuilt 1.88:1 reduction, 5" coupling. Borg Warner Velvet Drive 72 Series Rebuilt 2.57:1 reduction 5" coupling. Rebuilt Borg Warner V-drive complete. Ratio 3.14:1 gear driven. 73 Series Reman. Exchange. Reduction by request. New Surplus HSW630 H1 Hurth Marine Transmission, 1.5:1 ratio, New Old Stock at discounted pricing. Looks new - unpainted from factory. Used take out HSW 360 - 1.5 reduction, has some wear on front shaft. Good for parts or temporary use. Vulcan Damper Drive Plate Couplings, p/n 1KT411019, very little use. ZF Mounting Bracket Set as used on IRM/ZF 280V-LD. New Take off units, 1/2 price of new. Paragon P220 rebuilt 2:1 reduction. As used in US Navy Motor Whale Boat. Paragon P400, Z8442R 6H3052, 3:1 reduction, set up for RH prop, can be changed, weight 230-lbs, good running take out with less than 100 hours from rebuild. Used Paragon Transmission 1.5:1 ratio. Twin Disc MG5050SC 2.04-1 Reduction. SAE #3 Housings. Under 300 Hours use. Drivesavers as fitted to Twin Disc 509 (List $389) Special price $150. Used but in very good condition. Twin Disc MG506 1.97-1 reduction. Spec # 33893. S/n 380855. Cust. # 211612. Has SAE# 2 housing. Left hand. Originally removed from Cat, with rear starter opening. Works on other SAE#2 housings also. Good running take off. Drive Ring can be supplied at additional cost. Twin Disc take off mounting bracket set used on MG5061A Model. Twin Disc take off mounting bracket set used on MG5050SC Model. Twin Disc 506-1 S/N: 3NO510 - Ratio 1.5:1 - BOM #37497. Ex Government, good running Take-off. SAE #1 with spider ring drive included. Twin Disc Clutched PTO suitable for SAE #2. Type SL2 11HP2, s/n 1J8038. New Take off unit. $3800 new. Twin Disc Clutched PTO suitable for SAE #2, Type SL211HP2 s/n 3200637 TD BOM# SL211P201. New surplus. Model #SL111HP2, SAE #1 including flywheel drive ring, BOM # SL111P201, Low Hour Take off units. Call for price. Offset down angle 8° deg. Used but in working order. RO20 2.05:1 Ratio s/n 11161, straight output, no snout. Ratio 2.0-1 s/n's 68474 and 35148. Ratio 3.12:1 s/n 55017 & 55016. Gear Drive has a drop parallel output. Walters Gear Drive only $1400 each, or with 1018-002 1:1 Velvet Drive $2100 each. These are both low hour take outs in good working order. Not sure of diesel rating, gasoline 300 HP @ 4000 RPM. Ratio 2.58:1, s/n 42977, used/serviceable condition. 2:1 A0402/86. Good running take out unit. Allison AT 545 transmissions available as removed from above listed industrial engines. These were all in operational condition, ex municipality. Complete with torque Converters. Weight: 289 lbs, 131 kg. Allison MT653, automatic transmission, running take off. Re-man Ser 9208005775, Part # 23043291, Ref # 2410240795, was fitted to 3208 Cat at 210 HP, has PTO output. Low Hour take offs ex Fire Trucks (low miles) Were mounted behind Detroit Diesel 8V92T Engine. S/N: 2510034107 Part No. 23010879. Units have torque converters. Choice of two identical units. Front independent mount housing removable for direct couple. These gears commonly wear the front input shaft - this one is in very good condition. New Takeoff Cummins Turbocharger HX30W, Assembly #4035052, Cust# 4035055/01/12/03, suitable for industrial - automotive. 8.3 C Series Marine Exhaust Elbow, 6" Exhaust Hose, 2" water inlet. Cummins B3.3 / 4B3.3 Industrial Exhaust Manifold P/N C6204135110, new takeoff. New Takeoff Cummins 8.3 Starter Motor p/n 3957589, 228000-5622 gear head starter. New Takeoff Cummins 5.9 Starter motor p/n 3957588, 128000-4222. New Takeoff Cummins Recon N-14 starter motor p/n 3603863RX, 11 teeth, s/n 01G. New Takeoff Cummins Alternator, p/n 3972730, 5293586 - 95 Amp, Delco Remy 19020204, K11JA07A. New Takeoff Cummins Alternator p/n 4936876, 5282836 100 amp, Delco Remy 8600009 (Old p/n 3972732). New Takeoff Cummins 4B 3.3 Alternator p/n C6008611611, 60 amp, Denso 600-860-1611, 101211-2941. New Takeoff Cummins 4BT Industrial Turbocharger p/n 3802317, Holset H1C, p/n 3522068 s/n 1177757. New Takeoff Cummins alternator p/n 3016628, 60 amp Delco Remy s/n 98A07 1117628. Cummins Starter Motor p/n 4078800, ex-government good running takeout, new price $4979. Price $1950. Cummins B3.3 Turbocharger exhaust manifold P/N C6205115130, new take off. Rootsamater Fuel Injection Pump, Low Hour takeoff unit, D824157 s4327152 3600 RPM, 147-0500. Rebuilt Bosch VE Injector Pump for 6BT 6 cylinder Cummins 67452, 0460426137, 06260806. Price: $750 with exchange. Holset Turbocharger unused assembly # 3528918 s/n 872516, cust no. 3528919-1-11/12. Type H1C. Cummins Flywheels – Takeoff units, p/n 4933464, 3999937, 3902331, 3287508, Price $575. Flywheel – Thin automotive type, p/n 3973519, price $575. Cummins Alternator, 12V, old part #4936879, new part #2874863, 5282841, new surplus. Cummins Alternator, 12V, part # 3967726, new surplus. Cummins Flywheel, P/N 3918959, suit. SAE #3 bell housing, Allison auto. Trans. Cummins Starter Motor, 12V, New Surplus p/n 3964428. Cummins Starter Motor, 24V, New Surplus p/n 2871256.
p/n 4038289, (New P/N 4955156RX) , Model HX35W, Customer No 4038287-04-04 s/n 03293314, new take off unit. p/n 3596721, Model HX40W, Customer No 3596733-02-01/6 s/n 03095584, new take off unit. New Cummins Marine manifold by Bowman model CM600. Combined water cooled exhaust manifold and fresh water header tank. Suitable for Cummins 6B 5.9 naturally aspirated marine engine only. New Surplus aluminum Oil pans including pickup tube p/n 5291847. Mostly used in the QSB Series. Unused surplus unit. 6” outlet O.L. 43” ins Stainless steel. Manuf by DeAngelo Marine Exhaust Inc. Part # 16688. Alt No 6856. Sbd Engine 450 C series. 12 Volt 130 Amp Alternator p/n 3935528. Cummins 12V, 160 amp Alternator - New take offs. Cummins exhaust elbow 5” outlet by 1-½” water inlet. New Perkins copper coolant pipe as used on the Perkins 4.236 from the salt water pump to the double oil cooler mounted on rear of engine. P/N NA000285. Perkin s 500 Series Industrial Flywheel, new takeoff P/N 4111D101. Perkins 100 Series Industrial Flywheel Housing, new takeoff, P/N 110446512. 500 Series Industrial Intake Manifold, new takeoff, P/N M133AF02. 500 Series Industrial Exhaust Manifold, new takeoff, P/N L778HF11. Perkins Flywheel, new takeoff, P/N 3121H044, casting no. 3121H04A/2, as fitted to 1000 and 1104. Perkins Flywheel, new takeoff, P/N 41117084, as fitted to Perkins 4.236 , 1000 Series and 1104 Series. Perkins Engine Harness, New, P/N NA004854. Perkins Engine harness, New, P/N NA004849. Perkins 4.236 Industrial Exhaust Manifold, New Takeoff, P/N 37781322. Fuel Injector Pumps as fitted to the Perkins 4.203, New Surplus, DPA 3240F588. As fitted on the M50, M60 & M80 Perkins Engines. Forklift Compressor, commonly used in Hyster, p/n 2488714 used in good condition. Flywheel Housing p/n 3713M047, casting # 3713531A/9, starter mounted on RH side from rear, 6 1/4” depth, normally used on 3.152 & 4.203. Flywheel Housing p/n 3713K034, casting # 3713K03A/4, fitted to AL80880 Volvo Truck, RH side starter, depth 5 1/2”. Flywheel Housing p/n 3713C082, take off unit. Flywheel Housing p/n 37135319, casting # 3713531A/9. New Take Off Bell housing back plate as fitted to KR70378 104.22 Perkins Engine. Old part number 110367580, New part number 110367570. New Take off Exhaust Manifold as fitted to some 100 & 400 Series Industrial Perkins Engines, part number 135616311. New Take off Alternators part number 185046320 (New Price $515), Surplus. New Take off Intake Manifold part number 135596710 as fitted on KF70216 Perkins Diesel Engine. New Takeoff Intake Manifold part number 135597110 as fitted on the Perkins M35 Marine Diesel Engine KE30303, price $285. This item is no longer available from the manufacturer. New Take off Bell Housing part number 110446512 as used on some of the Perkins engines series 103.15 & 104.19. This item is no longer available from the manufacturer. New Take off flywheel part number 4111D101 as used on the Perkins 500 Series Industrial Engines. Perkins Industrial bolt on oil cooler utilized on various 4236 & 1000 series models. Price includes filter head, oil cooler and filter, special price $153. Part number ZZ90033SS is now available in STAINLESS STEEL. The factory original which is no longer available was constructed of cast iron. Our replacement is made of high quality stainless steel which offers far more resilience to corrosion. It is supplied as a replacement kit, which includes all necessary mounting gaskets, hose connectors and mounting hardware. Select one of our stainless-steel elbows to suit your installation or contact us for a custom build elbow. Perkins HP Series Engine (400C) overhaul gasket set. Perkins Industrial 500 Series, Take Off Exhaust Manifold. Perkins Industrial 500 Series, Take Off Intake Manifold. Perkins Mounting Foot for 6.354, T6.354, 6.354.4 & T6.354.4 Engines. 71 Series Cylinder Liners #23502022. K.C. New Westerbeke Heat Exchanger P/N 19058. Fuel Pump DB 2829 4701J, p/n: 5967216 23503123 for 6.2 GM light truck. Remanufactured Fuel Injector Pump (NON TURBO) Pump Nos. DB2-4812 3450 Model 991590C81 Batch 030695QAS No Exchange required. T21-1001-004 s/n 51141, 4 bolt flange, splined drive, unused. # P350B178BIAB20-7, AMAB15-1 KC9-95-28640, Single inlet, Double output, unused. Small Gear Pump, 4 bolt mount, John S. Barnes Corp, Rockford IL, 9593 74912348. 480 V, 3 phase, 60 hz, 80 amps, system volts 277/480, Model ZTSH8EC-TAAAAELLPTUW, s/n 228429X, A1 Condition, had very little use. Mufflers - 5" In/Out, Straight In, 90° Out. Donaldson Muffler M100572 4" in & 4" out, new surplus $150 each. 26 x 18 RH Propeller, 2"
24 x 24 RH Propeller, 2" bore, 3 blade, Federal Ni-Bral Supercup. #2010/01/104/1442. New 20 x 18 x 1 3/4" Bore Propeller Hydroflite #10375 and #20101 F76-1199 KVD LH. New /unused Propeller 24 x 24, RH, three blade 1 3/8” bore, Michigan Dynablade. List $3495, discounted price $2600. 19 x 16 RH, 1-1/2” Bore, 3 blade propeller. Cutlass bearing for 2” shaft. Suitable for some Allison, Borg Warner, Capitol, & Newage Transmissions, Coupler type is TAPERED, Flange diameter 5.75 inches, Shaft Diameter 1-1/2 inches, 6 bolts, ½ inch bolt size, 4-3/4-inch bolt circle, Pilot (F) 3 x ¼ inch. 220 New Engine Parts including 220 injection pump. Large Bowman Heat Exchanger #OK190 (2 1/4" both sides) Surplus. New Hand Held Tachometer with attachments. 0-4000RPM. Bronze housing and impeller, Model 25768 s/n 75E1100, Mfg. 1995, hydraulically driven 2" in/2" out. JCB3C Ring & Pinion Gear. We also have British Leyland engine parts for JCB. 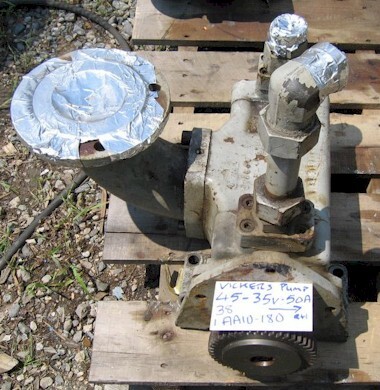 Goulds good used pedestal mount displacement water pump. Numbers listed on unit are as follows: 3196, 4 x 6 x 10, 749D055, Flood Oil Casint # 63988. Garrett Turbochargers p/n 352-096-4499 new/unused which fit to Mercedes Benz Diesel Truck, turbo s/n LJ0102 and s/n MB105. New surplus. Hydraulic motors, pumps, valves. Part number 20680, new part number HDL42680. Offered less drive shaft CV42, Accepts shaft size 2” for up to 550 HP Pleasure or 400 HP Commercial. Used for very low hours. In Frame Part # 181633C91. Has been in storage for some time, appears complete. International V8 6.9 Liter Engine Take off used cylinder head , as is. New Racor Marine Air Filter/Silencer Systems Model AF M408512, AFR is 800 CFM. A new Drivesaver absorbs vibration, prevents electrolysis, saves your drive train, and easy to install. Shown still attached, will be removed from machine. Other parts from this machine available below or on request. Other parts from this machine available on request. Has hydraulic raise and lower rams and arms. Air Compressor, High Pressure Electric Driven Factory Reman. Class T, Size 10 s/n: 56341, Capacity Discharge 11.4 CFM. 6000 PSI @ 800 RPM, 7.5 hp, electric motor, 220/440 volts, 3 phase continuous rating. Manuf. 1.25.91, Weight: 800 lb. CAT Forklift Truck Model T50B, 5000 lb. capacity, 130" mast, 42" forks, excellent condition. New engine instruments, Reman 6 cyl Continental L.P. gas engine. 80" to top of mass when lowered. Solid tires, repainted, and ready for work. CAT Forklift, similar model as above with side shift. Requires work. "AS IS"
Trailer mounted portable 4 x 1000 Metal Halide Amida Lighting Plant Model 5056D 4MHXN, Kubota Diesel Engine model D950, 5.6 kW mac-lima, 120/240 volts, 23 amps, single phase. Used in very good condition. Mfg. 1988, no hour meter. Waste Oil Storage Tank, 1000 gallon capacity, attached steps, removable lid, sight gauge, various fittings & openings on top. Diesel fueled 12 volt heater. Model 25 1480 01 8 KW @ 1.05 liters per hour or 4 KW @ .1/2 a liter per hour. Unit has never been used or installed comes in original packing case with manuals, fuel filter and remote control cable and switch. Gravely Slope Mower ATM 144 Model 995003 s/n 000105. Has indicated run time of 849 hours. Engine Cummins 4B3.9 Model, serviced by authorized Cummins dealer. Machine checked over, cleaned and freshly painted. 12’ Deck tilting cab for slope mowing or flat ground. Ready to cut grass. 24’ Life Boat Fiberglass, Manufactured by Marine Safety Equipment Maseco Corp., 40 person, Needs engine (rowing style), Mfg. 1981, 23.9’ x 8 ‘ x 3.48’ D.
These vessels were originally designed to carry 45 persons including crew. Commonly used for transporting passengers ship to shore. Currently being offered and priced without engine. These are project boats and will require some restoration work. Suitable Diesel Power units can be offered at additional cost. Several vessels to choose from. Powered Cummins 5.9 Liter 6cyl. Turbo diesel eng. Coupled to Borg Warner Velvet Drive “V” drive transmission 72 series, machinery has Low hours. This boat is capable of running at 20+ knots. She has had little use, a little fishing on local rivers. She has been given some expensive upgrades. Cabin has AC & Heat, Microwave Oven powered by 1 KW inverter. Depth sounder, VHF Radio & GPS. Lots of stainless steel accessories as shown in pics. Custom built cabin table and aft stainless steel deck table. Click here for more info. Fibreglass hull. Open Boat with removable frame work for optional canvas canopy. (nice to enclose front section) Vessel originally designed to carry 45 persons including crew. These vessels were mainly designed for ship to shore use. Vessel has been professionally refinished and painted. It is offered less engine which was originally around 110 HP. Fuel capacity 2 x 50 gal tanks.